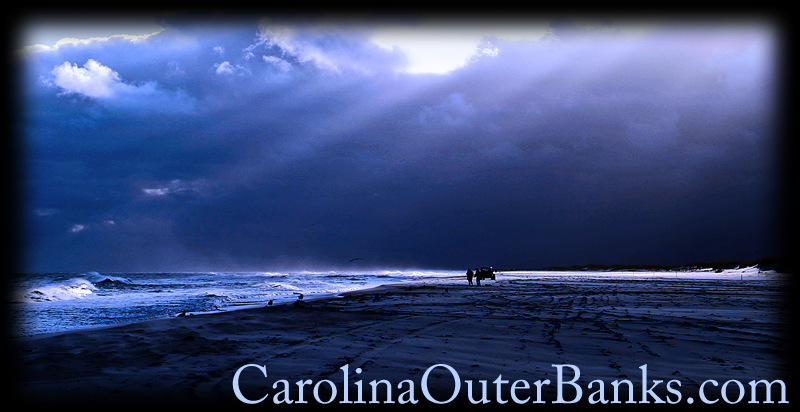 Many thousands of visitors flock to the Outer Banks each year. Beach-going families converge on the northern areas, from Nags Head northward as far as Corolla, to enjoy the sand and surf. Nags Head, Kill Devil Hills, Kitty Hawk, Southern Shores, Duck, Sanderling, Corolla, and the norhern "banks" provide a family atmosphere with plenty of spacious rental properties. Jockey's Ridge State Park at Nags Head and Wright Brothers National Memorial at Kill Devil Hills attract visitors year-round. Roanoke Island provides historic, educational and scenic attractions such as the Elizabeth II State Historic Site, Fort Raleigh National Historic Site, Elizabethan Gardens, and one of North Carolina's three state aquariums. Cape Hatteras and Cape Lookout National Seashores take up most of the remaining landscape on the Outer Banks. This protected coastal environment, which includes Pea Island National Wildlife Refuge, brings many who enjoy the fishing, wildlife, birdwatching, surfing, camping, kayaking, shell collecting, sailboarding and other activities. Visitors traveling with the added benefit of their own boat have the greatest freedom. Four-wheel drive vehicles add a great measure of freedom. Much of the national seashore area permits beach access, so exploration by 4WD is very popular. Another facet that brings visitors is the folklore and history. The Wright Brothers' first powered flight, the legend and history of Blackbeard, the Lost Colony, the bravery and service of the Lifesaving Stations, hundreds of shipwrecks, wild horses roaming Shackleford Banks and Carova, and its lighthouses add to the mix of compelling reasons why the Outer Banks is a fun place to experience.